It may have been overlooked, but if there was a single newsworthy item, it was that City Planning has finally completed its contextual zoning study for Greenpoint & Williamsburg. This is something the Community Board has been working with DCP on for over a year now, so we are anxious to see the details. DCP Commissioner Amanda Burden did announce that all of Greenpoint would be getting contextual zoning (as recommended by the Community Board). That means no more finger buildings, no more community facility bonuses, and more opportunities for inclusionary (affordable) housing. Elsewhere, the DOB discussion focused entirely on the issue of construction safety, as illustrated by the case of one homeowner whose foundation was undermined two years ago and is still homeless. DOB Commissioner Patricia Lancaster had, frankly, the usual response - we have more inspectors, new special enforcement teams, the ability to hold contractors criminally liable, blah, blah, blah. 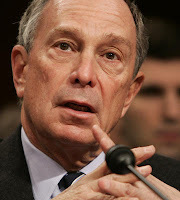 Bloomberg did step forward and promised to get involved in this particular case "next week." We will add other coverage as it's posted today.